We were very proud of Pam Knackert for being appointed and then elected Treasurer of District 6. Pam served from 1992-1996. 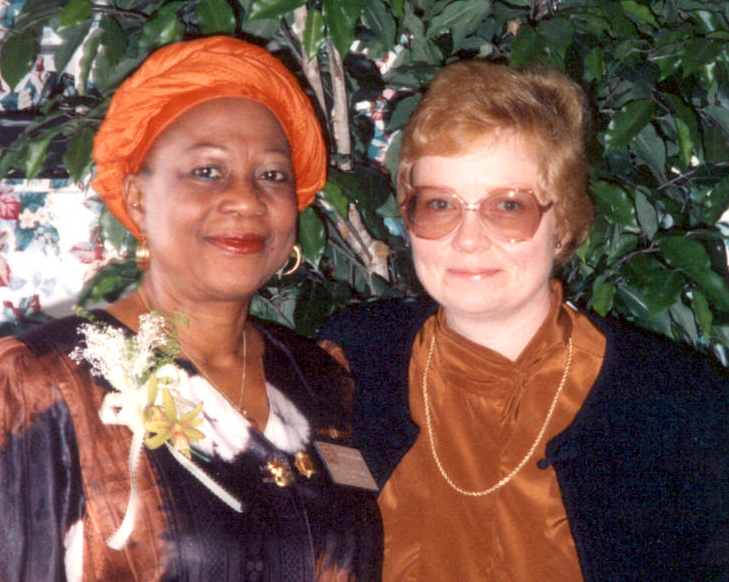 In the fall of 1993, Margaret Holzbog arranged for Zonta International President ‘Folake Solanke of Nigeria to visit with club members and have lunch at the Boulevard Inn. It was a real priviledge to be able to discuss Zonta issues with the current International President. Similarly, when Margaret was Governor of District 6, she hosted a meeting in 1996 with then Zonta International President Mary Magee of Australia. Several Club members attended. In 1994, in commemoration of the War Memorial’s 50th Anniversary, the Club received an award and Diane S. Lindsley as Club President was invited to speak and accept the award. Our real personal involvement with international needs – beyond raising funds for Zonta International/U.N. 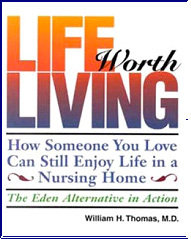 projects – came in the mid-1990’s with our participation in a Milwaukee based program Silk for Life, directed by Zontian Patricia Conwayur real involvement with international needs – beyond raising funds for Zonta International/U.N. projects – came in the 1990’s with our participation in a Milwaukee based program Silk for Life, directed by Zontian Patricia Conway. 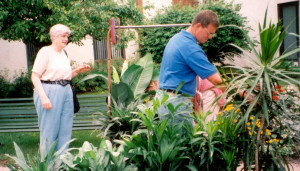 This involved a rather complex series of links between silk growers and weavers in Colombia, Hmong weavers and embroiderers in Milwaukee, the selling of scarves and hats by Zontians in Milwaukee to raise funds, using the funds to purchase twenty solar ovens manufactured here at Burns-Milwaukee, and then shipping the ovens in March, 1995 to villages in West Africa, via the Zonta District Governor in Lome, Togo. In June of 1995, Zontians Margaret Holzbog and Diane S. Lindsley attended the first ZISVAW Summit in Washington, DC. ZISVAW is the Zonta International Strategies to End Violence Against Women. 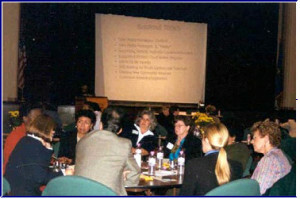 The conference was the first of its kind and involved service providers, law enforcement and legislators. 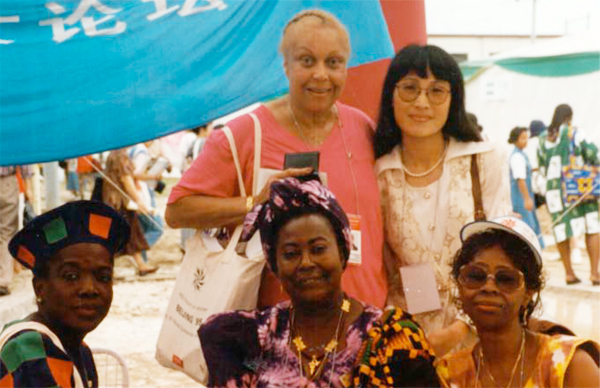 In 1996, Zonta International embarked on a ZISVAW project, the first international service project administered by Zonta International. Aileen Rockjordan (in red) with other Forum Delegates. In 1997, the Club gave Repairers of the Breach, a daytime shelter for the homeless, $700 to purchase two reconditioned sergers. There they were used to sew hats, scarves, leg and arm warmers. As Area 02 Director, Jacqueline M. Beaudry held a workshop on violence against women in Stevens Point, WI. From these efforts, came our Club’s two public forums on domestic violence held in 1999 and 2000. 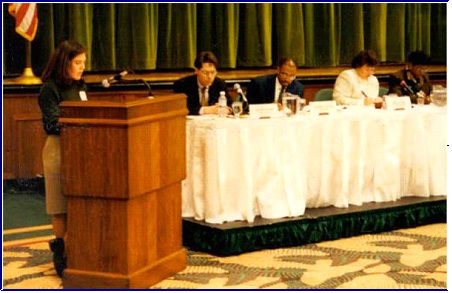 Held on May 24, 1999, “Violence Against Women and Girls in Our Community: Status, Trends & Perspectives” included a panel of legislators who addressed issues and resources available to abused women and girls. Service providers revealed the limitations of and ineffectiveness of laws affecting domestic abuse. Through communication, the panel and providers were able to share what works, what doesn’t, and what still needs to be done to break the cycle of violence. The Forum provided a unique opportunity for legislators, service providers, and assistant district attorney to discuss these issues. The audience became very involved in sharing their opinions and personal experiences. Strategies emerged that would enable legislators, service providers, police, district attorneys and the community to work more effectively together. Held on September 27, 2000, “Violence Against Women and Girls in Our Community”, breakout sessions included Teen Media Messages/Content, Teen Media Messages/Fund-Raising and Avenues of Dissemination, Supporting Victims/Launching and Sustaining Court Watch Program, Supporting Victims/Business Leadership in Advocating Change, Action Kit for Parents, Skill Building for Youth Leaders and Teachers, Creating Community Alliances to Address Relationship Violence, and Curriculum Advocacy/Legislation. 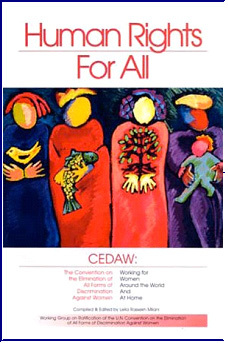 The Club was also working through the Wisconsin Working Group for the Ratification of CEDAW to ensure that the US Senate ratifies this significant treaty regarding women’s rights. For several years, Zontian Diane Lindsley led the Working Group. After her term as District 6 Governor, Margaret Holzbog continued her service to Zonta as International Environmental Committee Chair. At the 1994 Zonta International Convention in Detroit, Margaret held two Environmental Workshops. Diane S. Lindsley was a presenter. 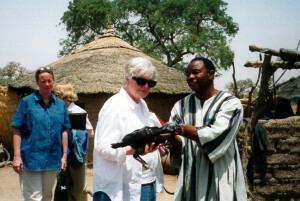 Margaret’s International commitment was followed by Chair of International Service projects from 1998-2000. Zonta International Foundation’s project with UNICEF on Female Genital Mutilation in Burkina Faso prompted Marge to personally visit and assess progress. The Club’s Status of Women Committee organized and presented a job preparation series of programs for clients at Shade Tree. Other topics included Skills Assessment, Self-Esteem and How to Handle the Work Environment. The Literacy Committee began mentoring and tutoring students at The Homework Club. Zontians Kim Brinsko and Sammie Lou Krieger were volunteer tutors at The Homework Club. Lastly, the Environmental Committee, headed by Zontian Margaret Holzbog, worked at Friendship Village, helping to implement the Eden Alternative philosophy of residents’ activities including the nurturing of plants and pets at the facility.